Melbourne is set to become home to the highest residences in the southern hemisphere, following the approval of a $900 million, 100-level tower. Aspial Corporation Ltd, will surpass Melbourne’s current tallest building, the Eureka Tower, by 22 metres when it is completed in 2019. With habitable levels up to level 100 it will be Australia’s tallest occupied building, surpassing Q1 on the Gold Coast, which, although four metres taller, only has 71 habitable levels. Fender Katsalidis, it will feature 1105 luxury apartments and a golden starburst at levels 70 and 71, located over 210 metres above the city that will house Melbourne’s highest and largest recreational facilities area for residents, including two infinity pools, fitness centre, private dining spaces and two gymnasiums. 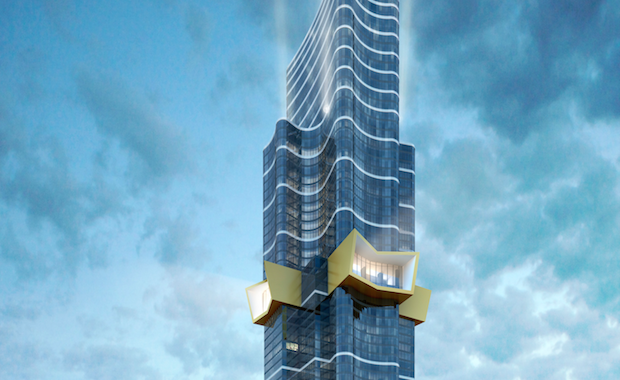 To be located at 70 Southbank Boulevard, and within 100 metres of the Eureka Tower, construction will commence mid-2015 and be completed over three stages. said the building would be Australia’s most significant tower. “This spectacular building will define Melbourne’s coming of age as a world-class and progressive international city,” Mr Katsalidis said. The tower will feature ground floor retail tenancies, a multi-level residents’ carpark clad in a green urban trellis and extensive communal facilities for residents at podium level including a 25 metre lap pool, gym, sauna, steam room and private theatre. The penthouse will exclusively occupy level 100. The owner and their neighbours living in the 170 apartments above the starburst will have dedicated, exclusive access to private recreation facilities located on the upper level of the starburst. said the tower will redefine luxury living. “We are extremely proud to be able to deliver such a landmark project in Melbourne, where we see a great appetite for luxury apartment living,” Mr Koh said. The tower has been designed to build a visual relationship with Eureka Tower, also designed by Fender Katsalidis, through the white stripes that envelope the tower, and which have integrated LED lighting at night to accentuate the curving forms of the façade. The golden starburst visually penetrates the tower’s slender soaring forms with a sculptural exuberance inspired by the Federation Star on the Australian Flag. The tower’s Southbank site was bought in December 2013 by Aspial’s World Class Land from a consortium including Nonda Katsalidis, investor Adrian Valmorbida, developer Benni Aroni and an international syndicate Beulah.